Here's another from deeeeeep within the archives. In the late 60's and early 70's, I was getting very into surfing. 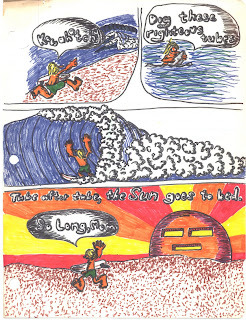 At that time, Rick Griffin was a pretty regular contributing cartoonist for Surfer Magazine. 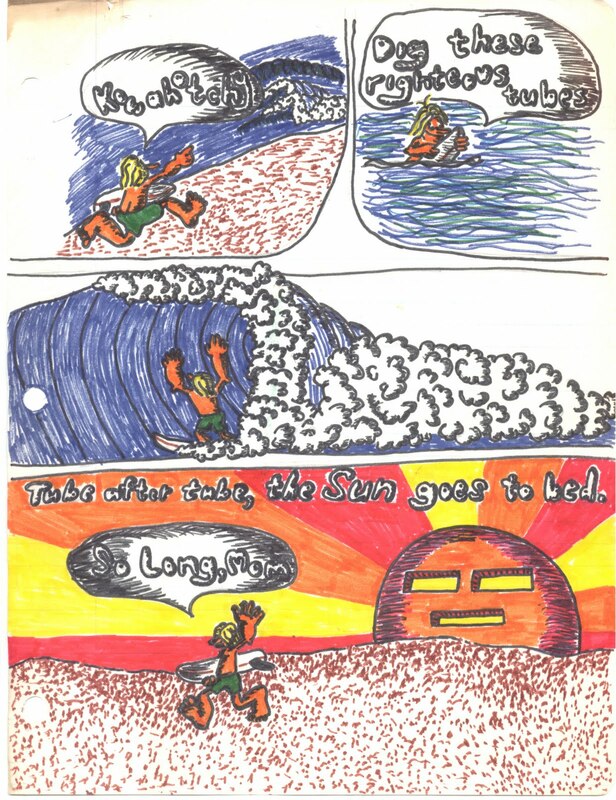 He had developed the famous surfing character, "Murphy". His art is unbelievably wonderful though, so I spent some time trying to create that graphic presentation. So, this example is an attempt using just the old colored felt tip pens and regular notebook paper. I am sure I did this during one of my really boring classes in high school. You can see that the paper has started to decay as you can see the brown area in the upper lefthand corner. This is only one of many pages, which I will post sometime soon. Surfing and cartoons....another wonderful combination! !